“A moose you would shoot on the last day of your hunt is a moose you should shoot on the first day.” So advised Dan Goodenow when I met up with him in Whitehorse two years ago, after flying in from Ottawa. 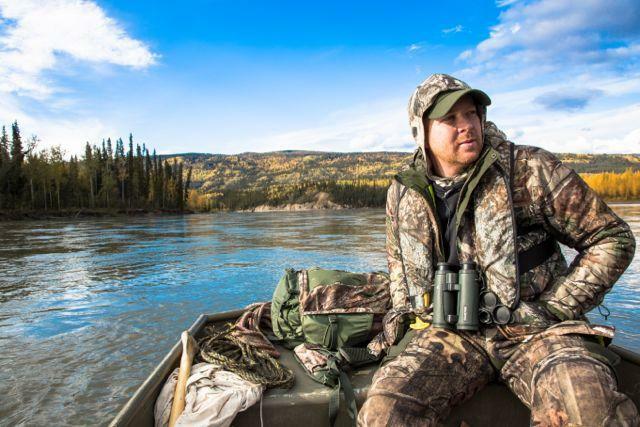 He’s hunting TV star Jim Shockey’s right-hand man, and I was en route to Shockey’s 30,000-square-kilometre Rogue River Outfitters territory in the Yukon wilderness. Since I’d be hunting giant Yukon-Alaska moose for eight days, I didn’t give Goodenow’s words much thought at the time. My trip was to be filmed for an episode of Jim Shockey’s Hunting Adventures, and while the chance to have the hunt captured in high-definition was a thrill—and just a bit of extra pressure—I was also excited about working with Shockey’s world-class outfitters at his northernmost outpost. I’ve been lucky enough to hunt and fish in some incredible places across North America, but I’d never been on a hunt so far north—or so remote. The journey to camp was an adventure in itself. Also meeting me in Whitehorse was Cody Altizer, a talented young cameraman from Virginia who would be filming for Shockey for the first time. He’d never been to Canada before; nor had he ever seen a moose. After staying the night in Whitehorse and getting more sage advice from Goodenow, Altizer and I travelled north for four hours by road to the village of Mayo. There, we met Brian “Wojo” Wojciechowski, one of Shockey’s most experienced guides, who filled us in on what we could expect once we arrived in camp. The next morning, Altizer and I climbed aboard an Otter for the final leg of the journey. As we soared over the wild, northern terrain, I thought about the adventurers who braved this same rugged land during the Klondike gold rush more than a century earlier. I’d brought along a book about the gold rush to read during my downtime, and when I finally saw our camp—little more than a wall tent and a Coleman stove—it wasn’t hard to imagine what life was like back in those days. The massive grizzly print on the tent’s wooden floor, along with the grizz hair on the scratching tree beside the firepit, was a little unnerving, but that comes with the territory. It was a good reminder, at least, to take every precaution with storing our food and any meat from the hunt. I had a grizzly tag in hand if the opportunity presented itself, but the focus was on a big bull moose. Meeting us at camp was Brian Arguin, a flatlander from Moosejaw, Saskatchewan, who would be my guide for the next eight days as we hunted along the Stewart River. Arguin is a very experienced guide and hunter, and we hit it off instantly. The author scans the Stewart for bull moose. Credit: Cody Altizer. 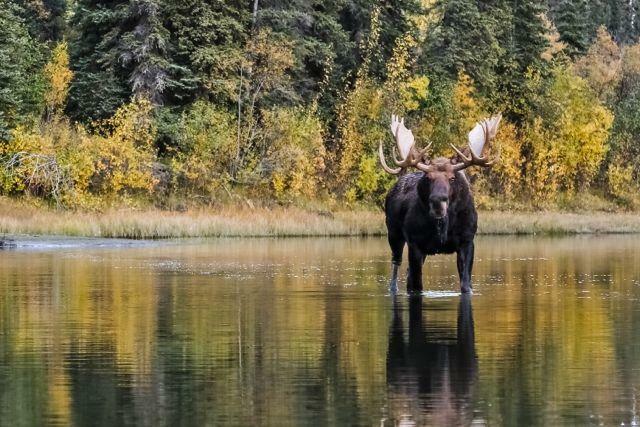 Among the reasons this beautiful part of the world is renowned for its trophy moose is the mandatory six-hour wait before hunting if you arrive by plane. Why the delay? So that you don’t scout from the air on your way in. At least that gave me lots of time to get settled and sight-in my Sako .300 Win. Mag. Once the wait was over, we jumped aboard a 16-foot jon boat with a 30-horse jet engine for an evening hunt on the Stewart River. Soon we were navigating our way up the beautiful, frigid waterway, which had once been a route for gold-hungry prospectors. In our own way, we were also hunting for Yukon gold, but unlike so many of those gold rush miners, we weren’t going to take long to strike it rich. We had only travelled a few kilometres upriver, in fact, when Arguin’s keen eye spotted a big rack upstream, about 500 yards off our starboard in the alders. Even from a distance, you could tell he was a shooter, so we quietly ditched the boat and got set up onshore. A big bull greets the hunting party. Credit: Cody Altizer. All Arguin had to do was hold up his paddle, pretending to be another bull moose, and the cantankerous bull was ready to fight. The giant instantly started thrashing the alders with his rack and grunting as he swayed back and forth, making a steady approach down the shoreline toward us. I was going to have to make a quick decision, as he was coming in fast. Part of me was looking at those antlers knowing I’d never seen an animal so big before, and that it would make for an awesome wall hanger. Another part of me, however, felt that since we found a shooter bull in the first hour of the eight-day hunt, there would surely be bigger bulls to come. It was a good problem to have. Then I remembered what Goodenow told me back in Whitehorse: A moose you would shoot on the last day of your hunt is a moose you should shoot on the first day. With an estimated 60-inch rack in front of us, it appeared that was exactly the situation I was dealing with. I decided to take the bull. As I contemplated my strategy and shouldered my Sako, Arguin kept calling until the bull was so close I could almost feel his breath. With the magnificent beast less than 11 paces out and coming straight at us, it was time to take action. Grunting, Arguin waved his paddle to the left then right, trying to get the bull to turn broadside, but he would have none of it. At that, I tucked one shot in under the bull’s chin and two more in his vitals for good measure as he turned. He only went another 20 yards before falling and expiring almost immediately. And as a bonus, he dropped just 150 yards from the shoreline, making it easier to get the meat to the boat. 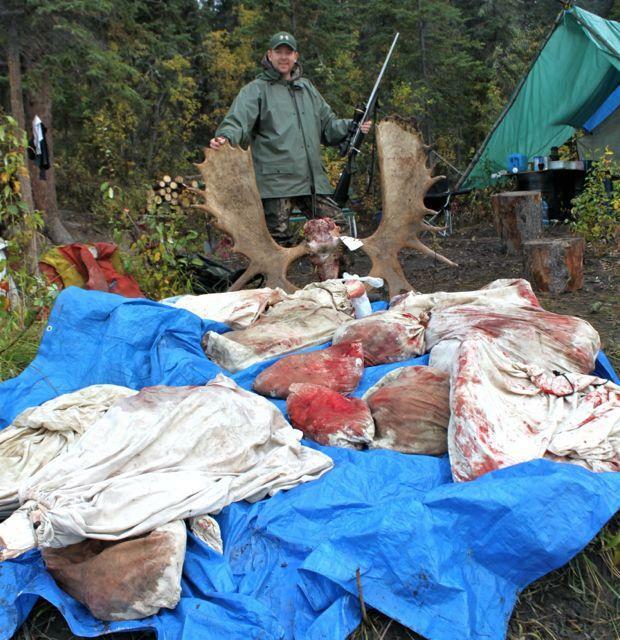 Yukon hunting laws stipulate that not one ounce of game meat can be wasted, so we had our work cut out for us—these Yukon-Alaska moose are easily one-third larger in body size than their Canada moose cousins to the south. And we needed to act fast or we would be spending the night under the stars with fresh meat in grizzly country. Guide Brian Arguin and cameraman Cody Altizer begin field dressing the author’s bull. Credit: Cody Altizer. It was 2 A.M. by the time we had the meat in bags and loaded in the boat, but Arguin was confident we could make the journey downstream. He explained that the river’s treacherous deadheads pointed downstream, which meant we were much less likely to end up with a punctured hull than if we were headed upstream. So, with our high-powered LED flashlights focused on the water in front of us, we slowly navigated downriver. Back at camp, we left the venison in the bottom of the boat, where the icy river would keep it cool. The next morning, a float plane arrived to deliver the meat to the butcher in Mayo. With almost seven days left at camp, I knew it wasn’t going to take long to finish my book about the gold rush. There was a chance I could move camps and try for a mountain caribou, but until then we hunted for grizzlies, looking for a big boar. We never did see one, although we had more close encounters with magnificent bulls, some of which came crashing out of the woods at the sound of our boat. Meanwhile, our camp became the stomping grounds for a juvenile black bear that decided he was going to make us sleep with one eye open, our firearms at the ready. The bear was even so bold as to stick his head in Arguin’s tent one night. Back at camp, the author stands over the results of his successful hunt. Credit: Cody Altizer. 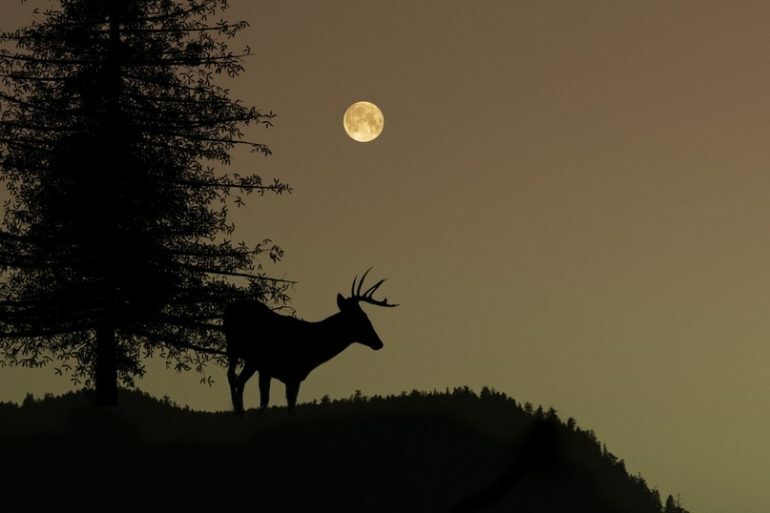 Finally, with four days remaining, Arguin spoke with Wojo via satellite phone and it was confirmed I would be moving to a mountain camp to go after caribou. The next morning, however, we awoke to snow blowing sideways. By day’s end, all of Shockey’s Rogue River Outfitters camps were closed for the season and the hunters, including me, were on their way home. 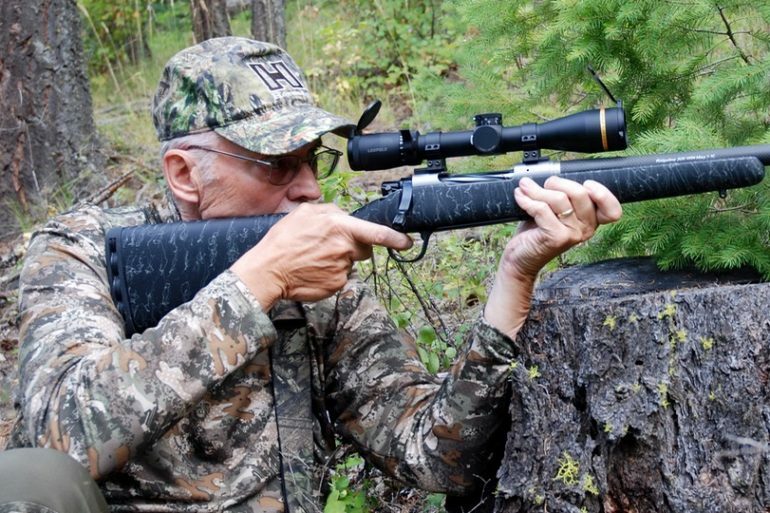 As it turned out, Dan Goodenow was right—a moose you would shoot on the last day of your hunt is a moose you should shoot on the first day. Because you just never know when your last day is going to be. 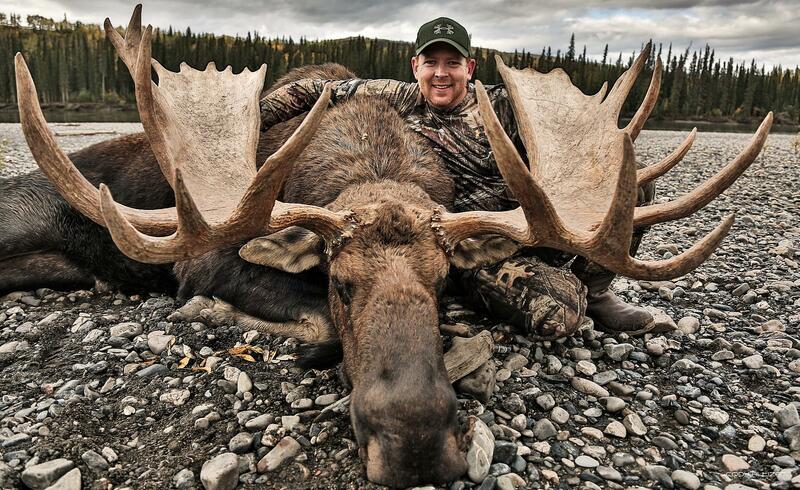 Brent McNamee’s latest big-game hunt was for a northeastern B.C. mountain goat. 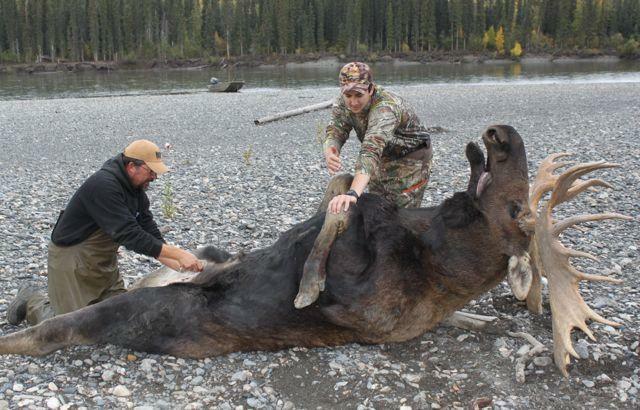 Watch a video of the hunt at www.outdoorcanada.ca/yukonmoose. 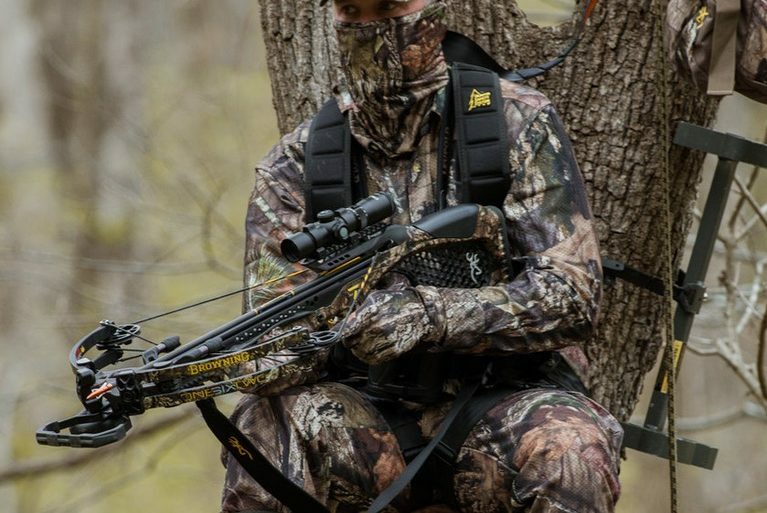 Learn more about Jim Shockey’s Rogue River Outfitters at www.jimshockey.com.